Always prepare timber by sanding well before applying a finish. You should sand with grits up to 320 or even 400. If you put in the preparation you will get a first class finish every time. If not you will get what you deserve. Prepare the surface, then apply a thin even coat of wax using a clean, soft, dry cloth, wait approx. 5 minutes until dry, then buff to a bright lustre using another soft, clean cloth. Brush on 2 to 3 thin coats of shellac or 2 coats of sanding sealer. Allow to dry, then sand lightly with 400 grit abrasive. Now apply a thin even coat of Traditional Wax using 000 or 0000 steel wool as the applicator. Buff immediately with a clean soft cloth. If the timber is open-pored, e.g. oak, etc. apply wax as follows: After preparing as above buff the surface with dry steel wool then apply Traditional Wax with a cloth instead of steel wool. Otherwise a white mark (or flecking) will be seen in the open pores of the timber after waxing. This is caused by the steel wool cutting the polish then depositing it in these open pores. Further applications of wax can be made if needed but should be applied with a clean rag instead of steel wool. Follow directions as for Raw Timber No. 1 above. 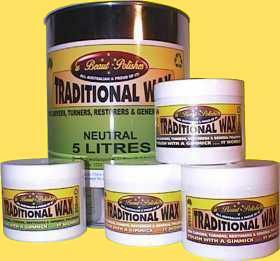 Use Traditional Wax as you would any other paste wax. You will find however that this wax should have a better shine than most and will be much easier to use. Apply Traditional Wax sparingly to the work using a boot brush, tooth brush or a soft bristled nail brush. Pay particular attention to undercuts etc. Allow to dry 10 minutes then buff to a lustrous finish using a soft, lint free cloth or a clean soft bristles brush. A double sided boot brush is ideal for this work. Brushes wash clean in turpentine or hot soapy water. NB: Use only uncoloured, natural bristle brushes as brushes with black or coloured bristles will transfer the colour onto the timber and make a real mess. Ideal for maintenance of bowls, platters, lidded containers, and all other turned items that have been finished with our Shellawax Cream or Shellawax. Use also to maintain oiled, shellacked, French polished, lacquered and waxed finishes. FOR FURNITURE and GENERAL MAINTENANCE POLISHING, ETC. Use Traditional Wax for the maintenance of furniture and most polished surfaces. Can be applied to French Polished surfaces and over all lacquers, polyurethane, Danish oil, etc. This wax is fantastic for use over Organoil if the oil is applied as per instructions. Make sure the surface of the timber is clean then apply Traditional Wax with a soft rag. Buff off with another clean soft rag and you have done. Neutral (clear in colour) use for general polishing on all timbers. Will not darken timber any more than wetting it with water. Baltic (Light - medium tan in colour) for honey coloured timbers, give white wood a light aged Baltic pine colour. Walnut (Dark blackish brown in colour) for brown timbers, will give white wood a dirty brown colour. Use to on mouldings etc to give a dirty aged look. The above are simulated colours and may vary from monitor to monitor and with different contrast & brightness settings, They will also vary dramatically on different timbers. We give no guarantee that the colour will be the same the as that of the product you purchase. Please use the above colours as a rough guide only. and now also available in 5 litre industrial tins. metal stirrer until mix begins to cool & thicken or the harder waxes may drop out of the mix. To rejuvenate hard Traditional Wax: Do the same as above but, add a small amount of mineral turpentine. DO NOT leave rag inside jar. Please ensure the lid is always securely fastened. If you have a thick build up of wax or oil etc. on the surface of your furniture this is best removed first using our Polish Reviver, before you apply any wax.